Kuan Yin, the androgynous spirit of compassion in Buddhism, is sometimes thought of as a queer Christ figure or LGBTQ role model. Buddhists celebrate the enlightenment of Kuan Yin today (July 22) this year. Christians honor Christ as savior, and Kuan Yin is a type of Buddhist savior figure called a bodhisattva -- an enlightened person who is able to reach nirvana (heaven) but delays doing so out of compassion in order to save others from suffering. Artists often show Kuan Yin with eyes in her/his hands and feed. They are like the wounds of Christ, but Kuan Yin can see with them. Kuan Yin is also known as the goddess of mercy and goes by different names in different places, including Avalokiteshvara in India, Tara (female) or Chenrezig (male) in Tibet, and Kannon in Japan. 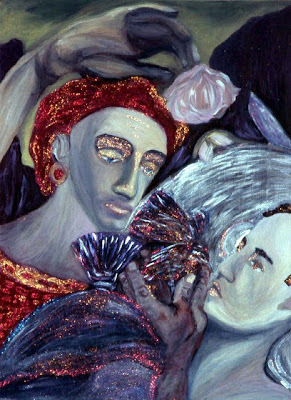 Writers and scholars who have explored the queer side of Kuan Yin include Patrick S. Cheng, an Episcopal priest who teaches at Chicago Theolgical Seminary; Hsiao-Lan Hu, religious studies professor at the University of Detroit Mercy; and Toby Johnson, a former Catholic monk turned author and comparative religion scholar. "Kuan Yin, the Asian goddess of compassion, can serve as a mirror of the queer experience. 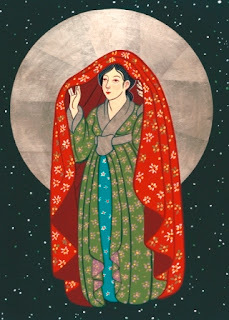 Specifically, Kuan Yin affirms three aspects in the life of queer people that are often missing from traditional images of the divine: (1) queer compassion; (2) queer sexuality; and (3) gender fluidity. In other words, Kuan Yin can be an important means by which gay, lesbian, bisexual and transgender people can see ourselves as being made in the image of God." "I have been intrigued by the possibility of Kuan Yin serving as a christological figure for queer Asian people. For me, it has been difficult to envision the Jesus Christ of the gospels and the Western Christian tradition as being both queer and Asian (although I do recognize that queer theologians and Asian theologians have tried to do so in their respective areas). It is my thesis that Kuan Yin might serve as a symbol of salvation and wholeness for queer Asian people of faith...."
Click for the whole essay “Kuan Yin: Mirror of the Queer Asian Christ” in English or in Spanish. Cheng's latest book Rainbow Theology: Bridging Race, Sexuality, and Spirit was published in 2013. He is also the author of “From Sin to Amazing Grace: Discovering the Queer Christ ”, “Radical Love: An Introduction to Queer Theology .” His series on “Rethinking Sin and Grace for LGBT People Today” was one of the most popular stories of 2010 at the Jesus in Love Blog. Hsiao-Lan Hu presented a paper on “Queering Avalokiteśvara” at the 2012 American Academy of Religion annual meeting. She noted that the Lotus Sutra says that Avalokitesvara will appear to teach different beings in different forms, based on what they can accept. Hu is the author of This-Worldly Nibbana: A Buddhist-Feminist Social Ethic for Peacemaking in the Global Community. "It says we’re really all One, all reflections of one another, that the distinction between male and female is illusory and needs to be transcended and that transcending gender is part and parcel with experiencing heaven now." Queer theologian Robert Shore-Goss applies the bodhisattva concept to queer Christian life in “Bodhisattva Christianity: A Case of Multiple Religious Belonging” in the 2013 book “Queering Christianity: Finding a Place at the Table for LGBTQI Christians.” Goss pastored Metropolitan Community Church in the Valley (North Hollywood, CA) after serving as chair of the religious studies department at Webster University in St. Louis. Images of Kuan Yin posted here were created by Tony O’Connell, Stephen Mead, Ralfka Gonzalez and William Hart McNichols. Mead is a gay artist and poet based in New York whose work has appeared internationally in cyberspace, books, and galleries. McNichols is a New Mexico artist and Catholic priest who has been criticized by church leaders for making LGBTQ-friendly icons of saints not approved by the church. His icons have been commissioned by churches, celebrities and national publications. O’Connell is a gay artist based in Liverpool. Raised in the Roman Catholic tradition, he has been a practicing Buddhist since 1995. He creates an artwork celebrating Avalokitishvara / Kuan Yin every year on his/her birthday. Viewers who look closely at his painting here will see an eye in the palm of the Compassionate One's hand. “There is an amazing statue of Avalokiteshvara in a Liverpool museum with a text that explains how the mustache was painted over to alter his gender as the people who met the monks on the spice routes from India struggled with the idea of a manifestation of compassion being male and wanted to see him as female. It occurs to me that there are subtle ranges of the same personality between Avalokitishvara, Kuan Yin and Tara as one gender ambiguous enlightened mind,” O’Connell said. For more about Tony O’Connell and his art, see my previous posts Reclaiming sainthood: Gay artist Tony O’Connell finds holiness in LGBT people and places and Olympics: Spiritual art supports Russia’s LGBT rights struggle. 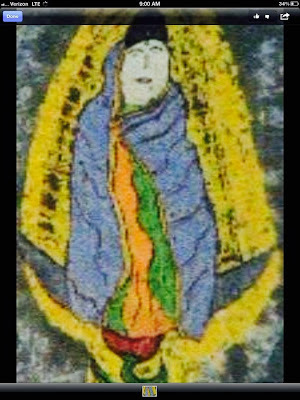 Outsider artist Ralfka Gonzalez links Kuan Yin not with Christ, but with his mother by painting Chenrezig as Our Lady of Guadalupe. In the Gonzalez image, he/she is wrapped in Juan Diego's cloak. His interpretation fits with the practices of Japan’s “hidden Christians,” who created statues of Mary disguised as Kuan Yin (Maria Kannon) when Christianity was outlawed from the 17th to 19th centuries. Lovely article and stunning images. Here's an article I posted and linked several years ago that might interest you, Kittredge.